Crystal jug 0.75l. Nostalgy Collection. Crystal jug for the Nostalgy Collection. Volume 0.75l. Size 27cm. Hand blown and engraved. Crystal jug for the Nostalgy Collection. 24% lead crystal decorated with elegance and a touch of nostalgia. This collection takes the highest quality crystal and enhances it with a beautifully designed decor. Perfect for those special moments. J'ai bien reçu ma commande - colis réceptionné en parfait état. Remerciements sincères, et à bientôt pour de nouvelles commandes. Crystal decanter 0.8l. Le Cristal et l'Or. 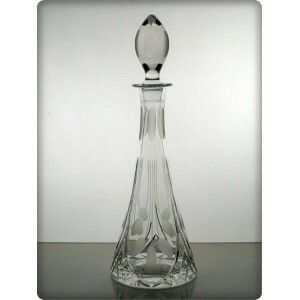 Crystal decanter 1.05l. Spiral Collection. Crystal fruit bowl 30cm. Classic Collection. Crystal vase 25cm. Red Gold Collection. Crystal bowl 20cm. Classic Collection. Crystal jug 1.3l. Le Cristal et l'Or. Box of 6 water glasses. Le Cristal et l'Or. Crystal vase 31cm. Decoration Chicago. Crystal plate 14cm. Classic Collection.